April 1, 1943 Dear Evelyn- Maybe it should be Dear Miss Corrie - as it has been so long since I heard from you. If the other members of Grace Church are neglected as you have neglected me, then it is time we had a change. I realize that you are a busy girl but then you have Monday off and from Tuesday thru Saturday you just get in gear for Sunday - so why not put aside a little job and write me a line. I presume that Mrs Stickman is now out of the Sunday School. (I'd make a little wager on that - to the contrary.) After all you remember there are a few in there you have to step around - Chickerings- Cohagen's - Miller's - Eaton's - Stickman's . ect - You just cant go busting about dislodging the old faithful. Now that I have a good start for an argument I shall write a letter. 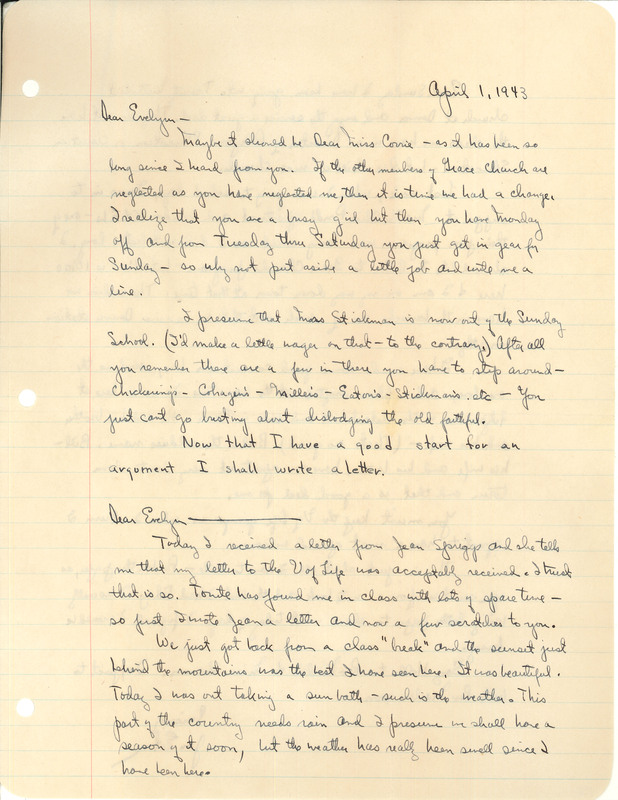 Dear Evelyn - Today I received a letter from Jean Spriggs and she tells me that my letter to the U of Life was acceptably received. I trust that is so. Tonite has found me in class with lots of spare time - so just I wrote Jean a letter and now a few scratches to you. We just got back from a class "break" and the sunset just behind the mountains was the best I have seen here. It was beautiful. Today I was out taking a sun bath - such is the weather. This part of the country needs rain and I presume we shall have a season of it soon, but the weather has really been swell since I have been here.